Paradise Cruise is a great way to experience the gorgeous UNESCO World Heritage Site of Ha Long Bay in complete and utter luxury. As the name suggests, you will feel as if you’ve entered heaven. The wooden junk has three decks that are home to an elegant restaurant, bars, seventeen luxurious cabins and even a massage room! 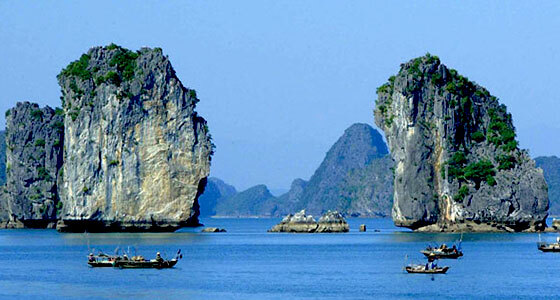 We’ll pick you up at your hotel in Hanoi early in the morning for your drive to Tuan Chau Island. You’ll arrive at the pier and embark on the Paradise Elegance around 12:15, enjoying a welcome drink as you’re checked in and given a quick briefing. 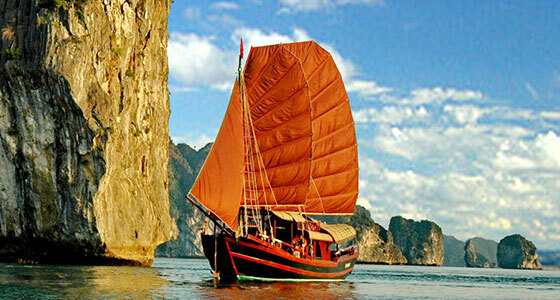 At 13:00 lunch will be served on board as we cruise towards Cua Van floating village. Once arrived you will transfer to bamboo boats to visit the village (or a kayak at an extra charge of 20USD) as well as the Dark & Bright Cave which is nearby. After this you will return to the boat for some relaxation and an optional spa treatment if so desired. At 17:30 there will be a live music performance during happy hour, before we anchor at Coconut Three Island and take part in a cooking demonstration. At 18:00 dinner will be served, before you can take part in a mixology class on the sundeck at 21:00 accompanied by live music. You will spend the night in your cabin on-board. Early risers can take part in a Tai Chi lesson during sunrise at 6:30am, followed by breakfast as we cruise towards Me Cung Cave and Tung Sau Pearl Farm. 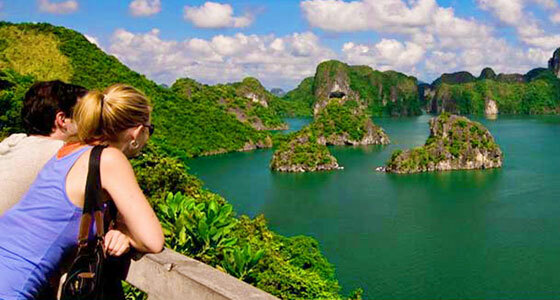 We will then stop at Ti Top Island, which offers the best panoramic views of the bay, before visiting Sung Sot Cave. Finally we return to the boat for a “behind the scenes tour” and checkout, arriving at the pier around 10:30 where our driver will be waiting to take you back to Hanoi. Early risers can take part in a Tai Chi lesson during sunrise at 6:30am, followed by breakfast as we cruise towards Me Cung Cave and Tung Sau Pearl Farm. We will then stop at Ti Top Island, which offers the best panoramic views of the bay, before visiting Tien Ong Cave by kayak. Early risers can take part in a Tai Chi lesson during sunrise at 6:30am, followed by breakfast as we cruise towards Thien Cung and Dao Go Caves. After visiting these gorgeous caves as well as Sung Sot Cave, finally we return to the boat for a “behind the scenes tour” and checkout, arriving at the pier around 10:30 where our driver will be waiting to take you back to Hanoi.